Good to write you again. Why did I say that this letter was going to be about the best movie villain of 2012? Because it is. Didn’t you notice the big picture at the top of this note? Don’t groan like that! You go on, time after time, imitating Sean Connery’s James Bond, and somehow you won’t extend a similar courtesy to me when I decide I want to talk about The Avengers for a while? When I have another movie to talk about, then we’ll talk about it. And after that, everything is fair game, except James Bond. I cannot talk, after all, about something I have paid so little attention to over the years. Oh, knock off bemoaning me as a lost cause already. Maybe someday I’ll actually pay attention to it, and then what are you going to do? Hah, got you there! All right, back to business. No matter what the critics say, the best film of 2012 was Marvel’s The Avengers. It has definitely set the bar for good movies a notch higher. Don’t roll your eyes at me like that! 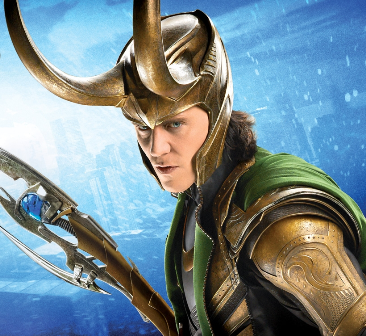 One of the reasons that the movie soars is because of its villain, Loki. Nasty and sinister sum up his plans nicely, and as for his personality – petulant, sarcastic, and vain about cover it. Oops, I may have just crossed my characters. Was I talking about Loki or about you? Now I’ve got you interested. So be quiet and listen. You’re laughing! I knew you would! There’s plenty more, Tony, if you watch the movie through! This is just the first of many instances where a member of the audience would say, “Finally, a villain who actually says what he thinks!” We all know by now that every villain believes himself or herself to be “burdened with glorious purpose.” But if you can find more than ten big, well-selling movies where the bad guy actually says it, you are way ahead of me. The big bad guys in every movie (and many other forms of entertainment, too) usually read from the same handbook. It’s been heard so many times that we all know the formula well: they speak about bringing utopia, they slaughter hundreds of people to get it, and then rule with a tyrant’s iron fist (or they attempt these three in the course of the movie). All are in vain, all only to fail. Loki does not entirely break from this script, except in his form of delivery, which – happily – breaks every rule in the Villain’s Handbook of Speeches. Another part of the villain mold that Loki strays from is in his incredible arrogance, which leads him to regard most of the heroes as extreme inferiors. This isn’t new, either, but again, it’s the way that Loki does it. After taking control of Hawkeye, scientist Erik Selvig, and a few other SHIELD agents, Loki has the sniper shoot SHIELD director Nick Fury. Loki’s contempt of humanity is so prevalent that he does not even bother to learn whether or not Fury is wearing some sort of protection (in this instance, body armor). He could easily have gotten this information from Hawkeye (when he was under his control) and had the sharpshooter make a final end of Fury, but he didn’t. On top of that, throughout the movie Loki time and again shows that it is only Thor’s physical strength that frightens him, since he well knows that Thor is the stronger, even without Mjolnir (the hammer). This focus on Thor (due as much to jealousy and envy as to fear) leads him to ignore the other Avengers because he believes they cannot match him physically and proves to be another of Loki’s Achilles’ heels. Loki’s foolhardy belief is disproved when the Hulk incapacitates him, and when Iron Man and Black Widow, along with an ‘awakened’ Selvig, help destroy his alien army and portal. His disdain when Hawkeye fires an arrow at him a few scenes earlier proves that he never bothered to learn anything about the man that he had enslaved, beyond his (Hawkeye’s) own usefulness to him. He is surprised when the explosive arrowhead knocks him off his ‘chariot.’ The entire time that these Avengers deal with Loki, Thor is busy elsewhere, having physically fought Loki only once so far. So Loki is not truly defeated by his adopted brother, but by a handful of – gasp – ‘mortals’! The final area where the villain formula is – ahem – smashed by Loki is when he comes face-to-face with the Incredible Hulk. Of all the mistakes he has made in the course of the film, this proves to be the trickster’s biggest. He shouts at the Hulk, believing him to be a “dull creature” he can bully. You’re laughing, Tony. Yes, this is a very unhealthy attitude for anyone to have toward the Hulk. Instead of letting Loki yap out a form of the expected “You cannot defeat me!” speech, the Hulk flattens Loki and leaves him moaning in his body-formed crater in the floor as he exits to kill more aliens. Of all Loki’s failures and subsequent humiliations in the film, this is the best, most spectacular, and definitely the most enjoyable!! So from beginning to end, Loki is both conventional and unconventional. A refreshing combination – and I cannot believe I just said that about a film bad guy – this attitude of his gives the heroes and heroines shining moments and pieces of dialogue they would never have had if he were merely conventional. All in all, this helps to make The Avengers more pleasing than any other comic-book based movie I have seen. Well, catch you later, DiNozzo. I got places to go and people to see. Hah, I got you back! Now scoot or I’ll get mad. This entry was posted in Movie Reviews and tagged Black Widow/Natasha Romanoff, Captain America/Steve Rogers, Chris Evans, Chris Hemsworth, Hawkeye, Hawkeye/Clint Barton, Hulk/Bruce Banner, Jeremy Renner, Joss Whedon, Loki, Mark Ruffalo, Marvel Cinematic Universe, Marvel Comics' Characters and Stories, Movie Reviews, Samuel L. Jackson, Scarlett Johansson, Speeches, The Avengers, The Hulk, Tom Hiddleston, Villains on April 22, 2013 by The Mithril Guardian.